Between February and April 2018, over 800 people discussed the future of Scotland’s food system through the Scottish Food Coalition’s Kitchen Table Talks. Conversations took place from the Scottish borders to the Shetland Islands, around dinner tables, in town halls, community gardens and allotments, at Universities and places of worship. 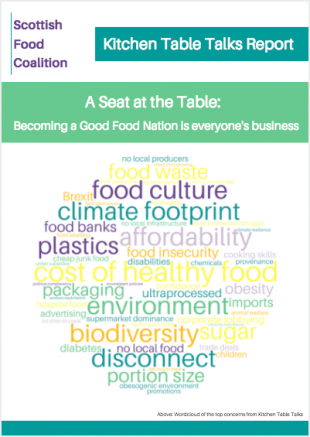 A Seat at the Table summarises people’s views and concludes that Kitchen Table Talks demonstrated a strong public appetite for participation in making Scotland a Good Food Nation. The report therefore calls on the Scottish Government to show leadership and host a truly inclusive national conversation on the future of our food system. 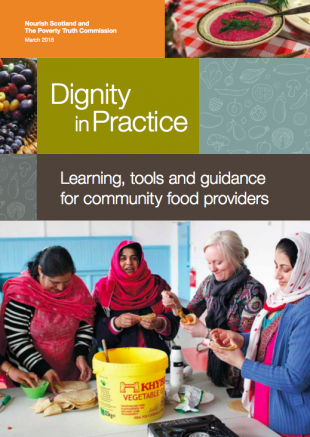 In March 2018, Nourish and the Poverty Truth Commission launched the report – ‘Dignity in Practice: learning, tools and guidance for community food providers’ – reflecting the learning from our year-long Dignity Project. The report provides practical guidance, case studies and tools for community organisations seeking to promote and restore dignity in responses to food insecurity. It highlights the importance of community organisations providing emotional and practical support to people experiencing food insecurity, as well as inclusive spaces for people in the community to access, share and enjoy food, regardless of their circumstances. As part of the Dignity Project, we also co-developed a set of reflective exercises to support staff, volunteers and those taking part in community initiatives to reflect on what more could be done to put dignity at the heart of community responses to food insecurity. Nourish Scotland worked with the Scottish Farm Land Trust to explore the issue of access to land for new farmers and how a land trust could contribute to a positive future for farming in Scotland. The Scottish Farm Land Trust is a new organisation which aims to increase access to land for new entrants who want to farm using agroecological methods. 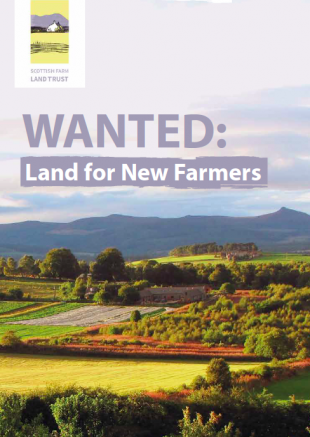 The SFLT aims to acquire farmland to rent out with secure, affordable tenancies, and in this way support a thriving farming landscape in Scotland with farms that are connected to local people. Nourish Scotland worked with Forth Environment Link to look at the opportunity in Stirling to lead Scotland in transitioning to a food system that is fair, healthy and sustainable. 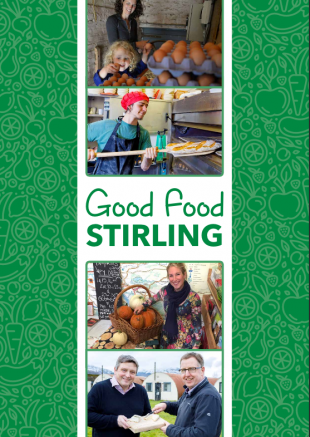 This ‘Good Food Stirling’ report outlines some of the brilliant work already underway in Stirling as well as recommendations for action. 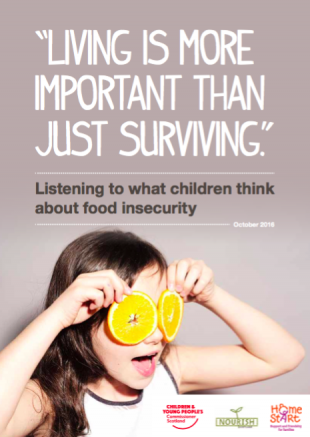 "Living is more than just surviving"
Nourish Scotland was commissioned by the Children and Young People’s Commissioner Scotland to listen to what children think about food insecurity. We listened to 32 children across Renfrewshire, Dundee, Glasgow and Edinburgh talking about the causes, coping mechanisms, and solutions to food insecurity. 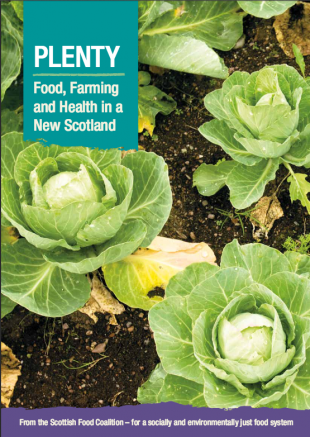 This report from the Scottish Food Coalition, of which Nourish is a founding member, made waves in Scottish politics, leading to commitments from the SNP, Scottish Labour and Scottish Greens for framework legislation for the food system. Describing our potential food future, as well as why and how we need to change, Plenty offers an up to date and comprehensive look at the whole system. There is no reason why we shouldn’t have plenty of good food for everyone in Scotland, we have the people and the resources to make it happen, but we need a coherent strategy that joins the dots! For more information on the campaign for framework legislation, see our campaigns page. 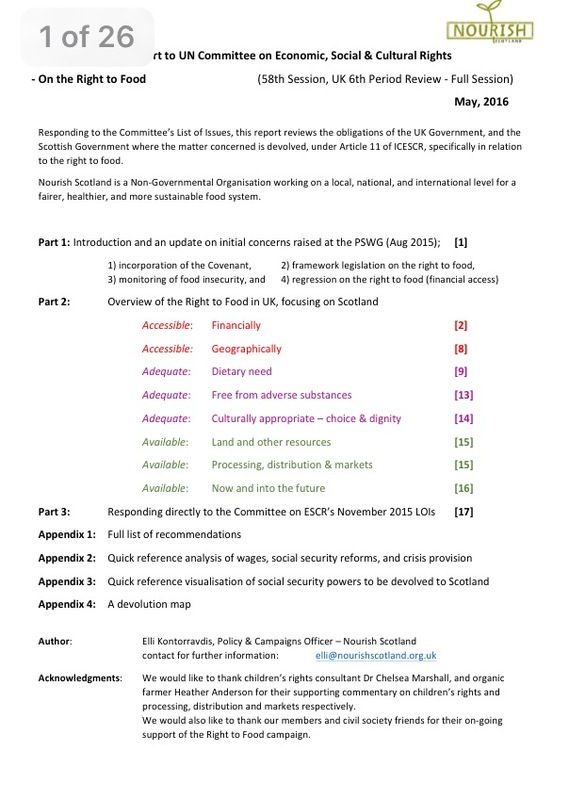 Nourish Scotland sent evidence to a UN Committee detailing UK and Scottish Government failure to meet obligations under international human rights law. The evidence highlights the impact of austerity and stagnant wages on the financial accessibility of food. There is no comprehensive monitoring of food insecurity in the UK but estimates suggest in the region of 10-20% are not sure whether they will have enough food to meet their needs. Some social security reforms have had a discriminatory impact on the ability of women, children and disabled people to afford food, contravening international human rights. Nourish Scotland advocates the right to food, believing that everybody from the moment they’re born to the moment they die deserves adequate good food. Policy Asks – Scottish Parliament election 2016 is a short briefing outlining our headline campaigns with core asks from the next Parliament. It was sent to all candidate MSPs on 29 February 2016. Food in a Common Weal Scotland is a think piece that Nourish prepared as a contribution to the Common Weal library. Common Weal was started by the Jimmy Reid Foundation taking the opportunity of the independence referendum to think about what would make Scotland a fairer, more equal society. Common Weal, an old Scots phrase means both wealth shared in common and for the wellbeing of all. Growing the Local Food Economy is a report based on a survey of local food businesses in Scotland, giving a better idea about the nature of local food in Scotland and a more comprehensive overview of the barriers preventing growth of the local food economy.